Traffic jams are a common occurrence in most cities. In some they are predictable, usually during peak hours in the morning and the afternoon or evening. These peak periods may range from less than an hour or stretch to a couple or even longer hours depending on the characteristics of the area. 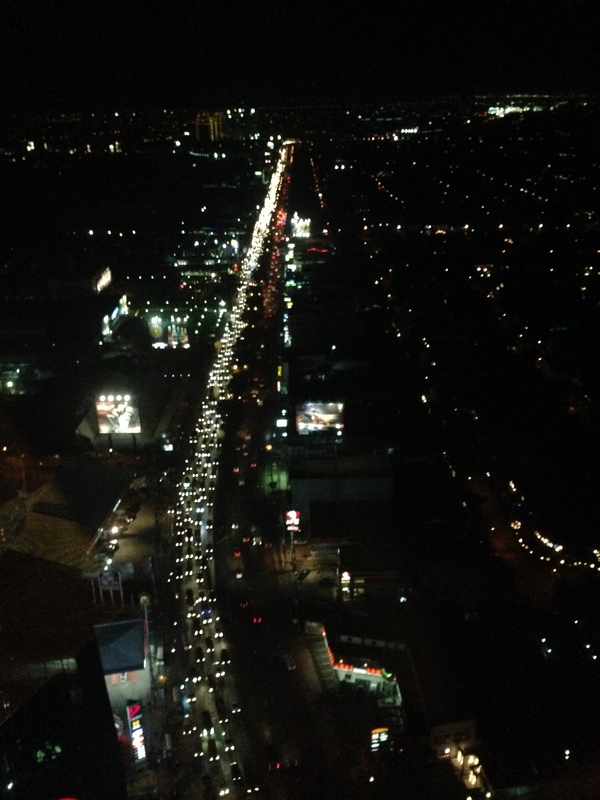 In many cases, congested are main corridors (Commonwealth, Ortigas, Marcos Highway, McArthur Highway, SLEX, etc.) leading to or from the city center or central business district (e.g., Makati, Ortigas, Cubao, etc.). In Metro Manila, it can be a corridor connecting CBDs like EDSA or C-5. Traffic congestion along the northbound side of Circumferential Road 5 seems much worse this December though it is always bad from the late afternoon to late night on weekdays. Congestion is usually worst along the stretch between Bonifacio Global City and Pasig River though it is also usually bad along the stretch from Ortigas Ave. to Eastwood in Quezon City. 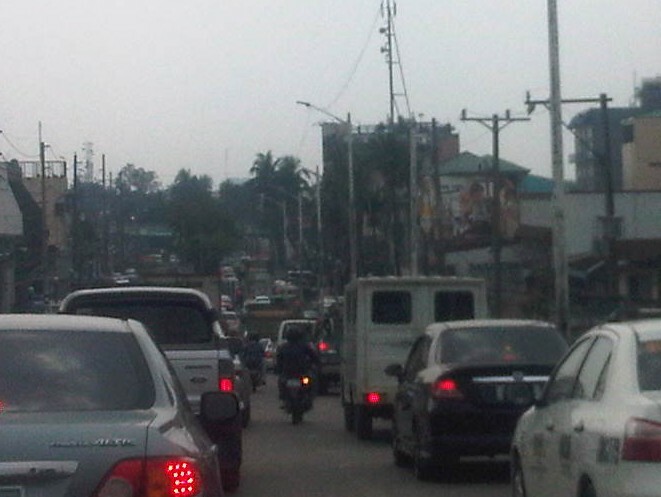 Traffic along the southbound side is usually bad in the mornings especially in the Pasig area. 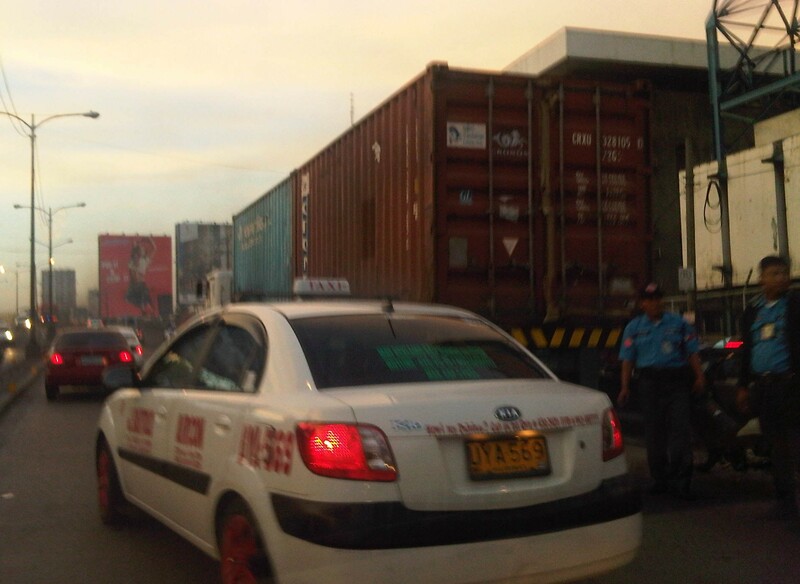 Traffic congestion along Tramo on the way to the airport – traffic can really be bad in the vicinity of airports during this season but then the way the terminals of NAIA are situated and the conditions along airport roads also contribute to the congestion. For example, along Tramo in Pasay City you will find a lot of bus terminals and informal settlements. There are tricycles and pedicabs operating in the area, and parked vehicles along the road that reduce capacity. I always wonder what local authorities are doing to address these issues considering NAIA is our prime gateway to the world. Unfortunately, the Christmas season in the Philippines is perhaps the longest in the world so Christmas traffic starts to build up in September (the first of the ‘ber’ months). Worst are days in December when everyone seems to be at their busiest. Aside from the work being done due to deadlines at the end of the year, there are shopping mall sales and Christmas parties. So how do we know if December is indeed the busiest month of the year in terms of traffic? What evidence can we show as proof to this long-standing perception that is accepted as fact by many? I was asked these questions in a recent interview but unfortunately, I didn’t have the figures to show that December indeed is the busiest month in terms of traffic. Unfortunately, too, our government agencies do not conduct data collection to determine traffic volumes throughout the year so what you can get from the DPWH is Annual Average Daily Traffic (AADT). Perhaps the evidence is with our toll operators, which conduct daily counts through their detectors and their toll booths. The cumulative volume of vehicles per month can be derived from data on tolls collected to validate the notion that December is highest in terms of traffic volumes. Meanwhile, there might also be video evidence from the cameras installed by the MMDA and other local governments monitoring traffic. Footage taken from January to December can be compared to show which months are the busiest. Taking this to another level, image processing software for traffic are now available or can be developed to determine vehicle volumes from video. It is reasonable to argue that indeed December is the busiest and we experience more traffic congestion during this month as there are more activities, especially those related to shopping, during this month. Ask anyone on the street and surely they will say that traffic and commuting is worst this time of year but many will also say they aren’t really complaining given the situation of other people (e.g., those affected by the earthquakes in Bohol and Cebu, and those affected by Typhoon Yolanda/Haiyan in the Visayas). For many, this is still a season for joy and we generally don’t let traffic get in the way of happiness. Here’s something for those who are parking at any of the Ninoy Aquino International Airport’s parking facilities. Here are a few photos showing the new parking rates at NAIA, effective December 1, 2013. Gone are the flat rates of old for those picking-up relatives or friends so it actually discourages people from camping out at the parking lots. Gone, too, are the low overnight parking fees of PhP 50 per night that a lot of people enjoyed for short trips on business or as tourists in local destinations or abroad. Information on new parking rates at NAIA effective December 1, 2013 found along the left side of the approach to the parking lot entrance. Information on the new parking rates at the exit of the lot and just before the payment booths. It goes without saying that with the increased parking fees at the NAIA, people would expect more in terms of the quality of these facilities particularly pertaining to security and cleanliness. One cannot expect to pay for PhP 300 per night for an open parking space where one’s vehicle is exposed to the environment as well as to possible criminal elements lurking about. Of course, there is practically no competition for these parking facilities so there is a sizable captive market for NAIA parking. In my experience, and in fairness to airport management, I have not had any untoward incidents when I did leave our vehicle at the parking lots of Terminals 2 and 3. And I have done so many times before on trips to the Visayas and Mindanao, and a couple of times on trips abroad. I hope others, too, won’t have any problems with parking at the airport. There have been a lot of posts on social media about the very crowded MRT and LRT stations. These posts are not new and the situation is not because of the Christmas season when a lot of people seem to be out and about the entire day, many doing their shopping. In fact, the stations have become very crowded mainly due to the increasing number of people taking the MRT and LRT lines. Unfortunately, the LRT 1 and MRT 3 stations were not designed to handle so many people. Only LRT 2 stations, which were designed like metro or subway stations in Singapore and Japan, seem adequate for its passengers. Below are two photos taken by a good friend, Raul, who is a regular user of the MRT 3. He took these photos sometime September of this year while heading home from his workplace. The photos don’t lie about the platforms being filled by people so much so that there’s a big risk of an incident occurring when people might fall off the platform. So far, there has been none reported. But of course, we don’t want such accidents to occur despite the conditions indicating one or more are likely to happen sometime soon if precautions are not taken. One cannot tell arriving from departing passengers except maybe by the direction they are going at the stairs to the platform at an MRT station. “Walang mahulugan ng karayom” translates into “nowhere a pin can be dropped” is a saying that is apt to the very crowded platform of the MRT 3’s Boni Avenue Station. Meanwhile, the conditions inside the trains are said to be like “sardines in a can.” I have even heard some of my students say it is more like “corned beef in a can” to describe how packed trains are during peak periods. I have experienced riding trains during the peak hours in Tokyo and Singapore and the experiences of my friend who took these photos (who also studied in Japan) are pretty much the same. The obvious issue aside from platform capacity is the fact that the MRT and LRT lack the rolling stock (i.e., cars or trains) to increase their frequencies of service (or reduce the headways between trains). They cannot lengthen their trains also because they are limited by the lengths of the station platforms. It doesn’t take a genius to determine how many units more the LRTA and MRTC need to add to the rolling stocks of LRT 1 and MRT 3 to improve their services. It is also imperative that the stations be improved, perhaps re-designed, to accommodate more passengers with more sophisticated fare machines and turnstiles, and longer, more spacious platforms. This is something that could have been anticipated by the agencies responsible like the DOTC, LRTA and MRTC years ago. For some reasons, however, there have been no significant actions regarding these transport needs. The end result is what we now see as the supply side of transport being inadequate for the increasing demand. There are many questions that commuters are asking regarding this situation with the LRT and MRT. The biggest seem to be about when the government will finally act on the issues mentioned. Is this something that requires Public-Private Partnership (PPP)? Is the government reneging on its responsibilities by not investing in mass transit? What can be done in the immediate term? Hopefully, these questions will be answered soon and agencies will have the sense of urgency to address the needs of the commuting public. A few months ago, and almost right after the local elections, the City of Manila embarked on a campaign to reduce the number of colorum or illegal buses plying along the streets of the city. The result was confusion and mayhem as commuters and authorities were unprepared to deal with the sudden decrease in the number of buses (some companies even restrained all of their buses from entering Manila to protest the city’ move) and the jeepneys and UV express couldn’t handle the demand. Much of that seems to have been resolved and buses are now back in Manila; although whether all these buses are legal ones is still unclear. The city, it seems to some quarters, was only after buses with no formal terminals in the city and appeared to have made the drive to show bus companies who’s in-charge there. Now comes a drive against jeepney drivers, particularly those undisciplined ones that are often found violating traffic rules and regulations, and endangering their passengers with their brand of driving. The result was a one-day strike (tigil pasada) of jeepneys belonging to the Federation of Jeepney Operators and Drivers Associations in the Philippines (FEJODAP), one of several organized jeepney groups in the country. Others like operators and drivers from Pasang Masda, PISTON and ACTO, opted not to join the transport strike. The result was a transport protest that had little impact on most people’s commutes though the group did manage to attract media attention and gave interviews to whoever cared to listen. Not to judge Manila as I believe it has made huge strides by confronting the many urgent issues in transport in the city. Not many cities take these problems head on as Manila has done this year. However, the jury is still out there if their efforts have been effective and if these will be sustainable and not the ningas cogon kind that we have seen so much of in the past. For definitely, there are a lot of other transport issues that Manila needs to contend with including how to make the city more walkable and bicycle-friendly (not an easy task!) and how to address the excessive number of pedicabs (non-motorized 3-wheelers) and kuligligs (motorized 3-wheelers using generator sets or pumpboat motors for power) in the city. Hopefully, again, the city will be up to the task of addressing these problems along with the persistent congestion along its roads. I’ve been reading some posts on social media complaining about the increase in the overnight parking rates at the Ninoy Aquino International Airport (NAIA). This seems to be a recent development considering the last time we used any of the parking facilities of NAIA was last November 23 when the wife parked to wait for my arrival at Terminal 2. It wasn’t overnight parking but then she said she doesn’t recall seeing any signs announcing changes in the parking rates. The posts I saw through Facebook are for overnight parking at Terminal 3 where the old charges were 50 PHP (about 1.14 USD) per day. This is actually very cheap even considering that parking is on an open lot with marginal security. Even parking lots in Makati, Taguig and Ortigas charge more for overnight parking on open lots. The new rate is basically 300 PHP per day including taxes, which apparently surprised a lot of people after everybody got used to the 50 PHP/day rate of old. That meant that for a 3 night trip to Bangkok or Singapore, for example, where people left their cars at the airport, they had to fork over 900 PHP instead of the 150 PHP they used to pay for parking. Indeed, that’s a big jump in parking fees! NAIA’s parking rates can be compared to the parking rates at the Los Angeles International Airport (LAX) is provided in their website. 30 USD (about 1,315 PHP) is charged for 24 hours for use of the multi-level/covered parking structures at the airport. Meanwhile, open lot parking charges 12 USD (about 526 PHP) per day. Suddenly, NAIA’s parking charges don’t seem to be expensive beside the 526 PHP/day charge at LAX. However, these rates are arguably in a country where there are higher wages and standards of living and so perhaps a fairer comparison would be for parking in a major airport in ASEAN. Doing a bit of research online, I found that Bangkok’s Suvarnabhumi International Airport charges the equivalent of about 341 PHP per day for parking. Singapore’s Changi charges the equivalent of around 701 PHP per day. And Kuala Lumpur International charges the equivalent of about 575 PHP per day for parking. [Note: Rates from the link may not be updated.] These are generally for multi-level parking buildings where vehicles are practically protected against the environment (e.g., rain, sun, etc.). A comparison is also made for the nearby Park n’ Fly facility, which also publishes their parking rates in their website. The site of the private parking provider states a rate of 340 PHP + EVAT (taxes) per day. And this is for a multi-level, covered parking structure near NAIA Terminals 1 and 2. An argument can be made here for the location and proximity of NAIA parking spaces compared to Park n’ Fly but note that the fee for the private entity includes airport transfers with their own vehicle. Compared to this, the NAIA rates are quite expensive considering that it is for open lot parking and for what is perceived as marginal security. In fairness to airport parking security, I have not heard or read about incidents of burglary or stolen vehicles in relation to NAIA parking areas. And so there are many questions that need to be answered in as far as the sudden and steep increase in parking rates at NAIA. The most important question here is what is the basis for the parking rate increase? It is assumed that the additional monies generated will cover certain expenses like security and maintenance. So there needs to be transparency in where the additional funds will go or how it will be allocated (e.g., repair works towards ultimately opening the multi level facility at T3). Also, perhaps the information dissemination for this rate increase was lacking and therefore ineffective in advising the public about the change. But then there was generally no major uproar over the increase so perhaps those complaining weren’t paying attention or were caught in the transition to the new parking rates. One can even say that certain posts in social media can be qualified as rants rather than objective takes on parking rates. I would like to think that parking as an amenity should not generally be a revenue generating scheme for the airport. Collected fees should cover operating expenses and excesses can be used to build a trust fund, for example, for future expansion of the facility, but the latter should be clearly spelled out in a plan for the airport. After all, it is in the best interest of the public, the users of the airport, if improvements can justify what they are paying for and how much they are paying.